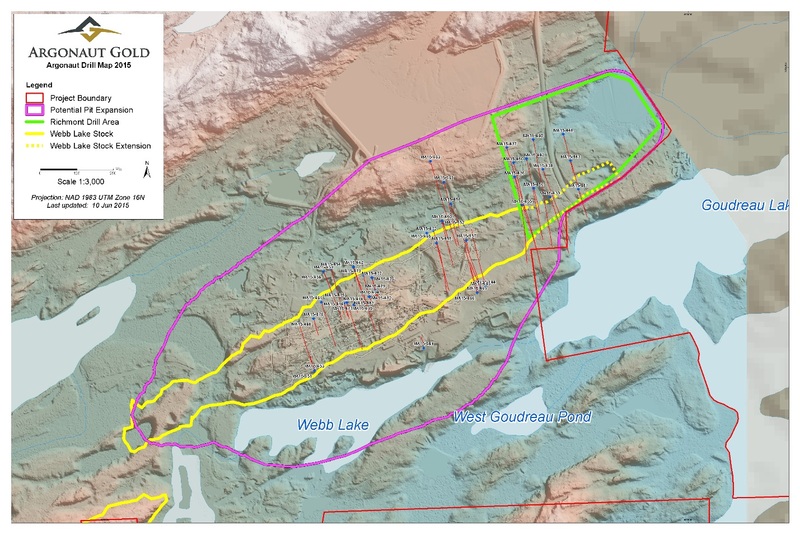 TORONTO, ONTARIO--(Marketwired - July 22, 2015) - Argonaut Gold Inc. (TSX:AR) (the "Company", "Argonaut Gold" or "Argonaut") is pleased to provide an additional update on the 2015 drill campaign at the 100% owned Magino project, located near Wawa, Ontario. 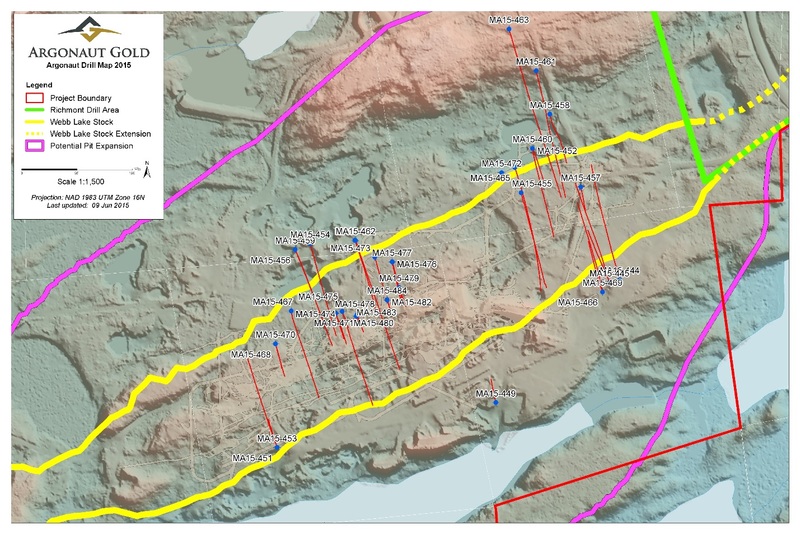 Peter Dougherty, President and CEO of Argonaut Gold stated: "I am pleased with the infill drilling program which identified higher grade mineralization, consistent with historic drilling, in the area surrounding the prior underground workings of the Magino deposit. We plan to incorporate this infill drilling along with the recently released drill results from the Richmont zone, which extended mineralization an additional 250 metres, into an updated resource statement. The revised resource and economic information based upon the updated resource is expected to be released later in the year." Vice President of Exploration, Tom Burkhart said "Now that we have completed this phase of drilling, we look forward to including this information into an updated mineral resource. I am encouraged by the results that we received from the drilling completed so far and see it as a clear demonstration of the unrealized potential that we believe the Magino project holds." The 2015 Magino drilling results will be incorporated into an updated mineral resource and Preliminary Feasibility Study (PFS) for the project which is expected to be released in late 2015. Argonaut Gold used Activation Laboratories in Thunder Bay as the primary laboratory for its analysis. The samples were analysed using a fire assay method with a 50 gram pulp size. All results greater than 5 grams per tonne were subsequently analysed using a metallic screen. Samples that were strongly mineralized or altered were selected for additional metallic screen analysis. Certified reference materials (standards) or blanks were inserted every 10 samples and preparation duplicates were taken every 50 samples. Full results of the drilling programme will be posted to Argonaut's website. Argonaut Gold is a Canadian gold company engaged in exploration, mine development and production activities. Its primary assets are the production stage El Castillo mine in Durango, Mexico, and La Colorada mine in Sonora, Mexico. Advanced exploration stage projects include the San Antonio project in Baja California Sur, Mexico, the Magino project in Ontario, Canada and the San Agustin project in Durango, Mexico. The Company also has several exploration stage projects, all of which are located in North America. This press release contains certain "forward-looking statements" and "forward-looking information" under applicable Canadian securities laws concerning the business, operations and financial performance and condition of Argonaut Gold Inc. ("Argonaut" or "Argonaut Gold"). Forward-looking statements and forward-looking information include, but are not limited to, statements with respect to estimated production and mine life of the various mineral projects of Argonaut; the estimation of mineral reserves and resources; success of exploration activities; the realization of mineral reserve estimates; the timing and amount of estimated future production; costs of production; and financial impact of completed acquisitions; the benefits of the development potential of the properties of Argonaut; the future price of gold, copper, and silver; synergies; and currency exchange rate fluctuations. Except for statements of historical fact relating to Argonaut, certain information contained herein constitutes forward-looking statements. Forward-looking statements are frequently characterized by words such as "plan," "expect," "project," "intend," "believe," "anticipate", "estimate" and other similar words, or statements that certain events or conditions "may" or "will" occur. Forward-looking statements are based on the opinions and estimates of management at the date the statements are made, and are based on a number of assumptions and subject to a variety of risks and uncertainties and other factors that could cause actual events or results to differ materially from those projected in the forward-looking statements. Many of these assumptions are based on factors and events that are not within the control of Argonaut and there is no assurance they will prove to be correct. Factors that could cause actual results to vary materially from results anticipated by such forward-looking statements include variations in ore grade or recovery rates, changes in project parameters, changes in market conditions, risks relating to international operations, fluctuating metal prices and currency exchange rates, the possibility of project cost overruns or unanticipated costs and expenses, labour disputes and other risks of the mining industry, failure of plant, equipment or processes to operate as anticipated. These factors are discussed in greater detail in Argonaut's most recent Annual Information Form and in the most recent Management's Discussion and Analysis filed on SEDAR, which also provide additional general assumptions in connection with these statements. Argonaut cautions that the foregoing list of important factors is not exhaustive. Investors and others who base themselves on forward-looking statements should carefully consider the above factors as well as the uncertainties they represent and the risk they entail. Argonaut believes that the expectations reflected in those forward-looking statements are reasonable, but no assurance can be given that these expectations will prove to be correct and such forward-looking statements included in this press release should not be unduly relied upon. These statements speak only as of the date of this press release. Although Argonaut has attempted to identify important factors that could cause actual actions, events or results to differ materially from those described in forward-looking statements, there may be other factors that cause actions, events or results not to be anticipated, estimated or intended. There can be no assurance that forward-looking statements will prove to be accurate, as actual results and future events could differ materially from those anticipated in such statements. Argonaut undertakes no obligation to update forward-looking statements if circumstances or management's estimates or opinions should change except as required by applicable securities laws. The reader is cautioned not to place undue reliance on forward-looking statements. Statements concerning mineral reserve and resource estimates may also be deemed to constitute forward-looking statements to the extent they involve estimates of the mineralization that will be encountered if the property is developed. Comparative market information is as of a date prior to the date of this document.